GENEVA, March 1, 2011- Ford is unveiling its dramatic new B-MAX vehicle at the 2011 Geneva Motor Show, providing an early preview of exciting innovations from Ford in the small car market. The B-MAX has a unique new body design which eliminates the traditional B pillar and features twin rear sliding doors. This innovative format - which has already been engineered for production - promises best-in-class access to the cabin, together with unmatched convenience and flexibility. The dynamic and stylish new B-MAX illustrates how Ford's kinetic design language can be translated to a unique new vehicle format.The innovation continues inside the cabin, where the interior offers exceptional space and versatility for such a compact vehicle. The use of high quality materials highlights the vision that small, practical cars can also be comfortable and well-equipped. 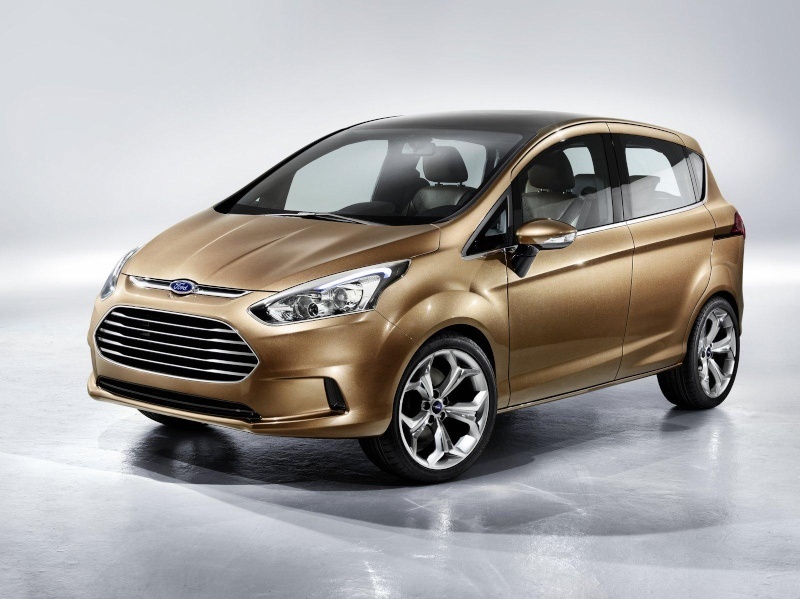 "With its highly popular S-MAX and Galaxy, and more recently the all-new C-MAX and Grand C-MAX, Ford has a proven history of bringing innovation and style to the multi-activity vehicle market," said Stephen Odell, chairman and CEO, Ford of Europe. "The new B-MAX signals that Ford is ready to bring the same bold thinking to the small car market. With its unique door format and dynamic design, the B-MAX sends a strong message that customers looking for a compact, stylish and versatile vehicle will soon have an exciting new choice." Based on Ford's global B-car platform - shared with the highly successful new Fiesta - the B-MAX is slightly more than four metres in length, the B-MAX is just 11 cm longer than the Fiesta five-door, and is 32 cm shorter than the new C-MAX. With this highly compact footprint, the B-MAX is ideally placed to meet the fast-growing demand for downsized cars which are better suited to congested urban conditions, but without sacrificing interior space and comfort. 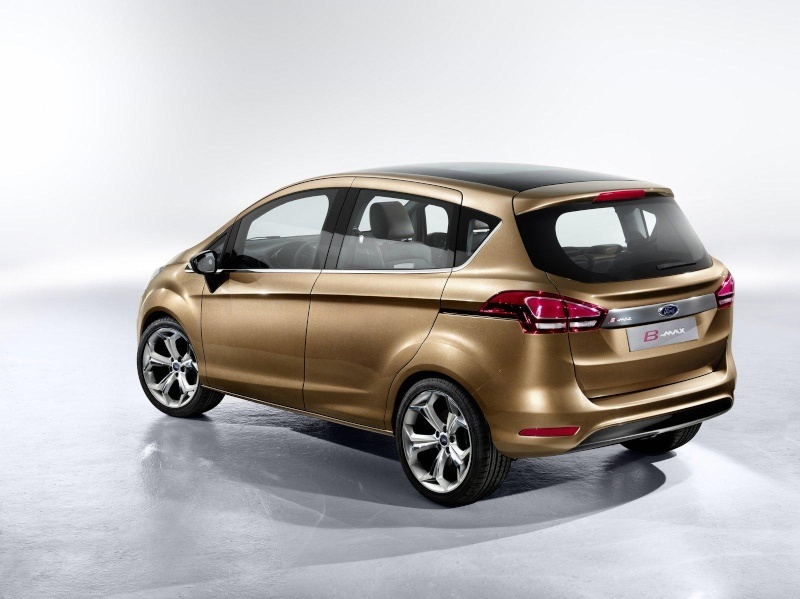 "With the B-MAX we set out to create a vehicle that captures the spirit of a smaller S-MAX," said Martin Smith, Ford of Europe's executive design director. "We wanted to show that a small car could be very spacious and practical inside, while still having the sleek, dynamic appearance that has made the S-MAX so popular." With both front and rear doors open there is outstanding access to the interior, with a huge, clear aperture measuring over 1.5 metres wide. This is around twice the width offered by competitors with alternative door concepts, making it significantly easier to enter or exit the rear seats, attend to children in child seats, or load shopping. Having folded the 60/40 split rear seats and the front passenger seat to create an extensive flat load floor, the side access is particularly convenient to load bulky items such as flat-pack furniture or even a bicycle. With the front passenger seat folded, the interior is capable of swallowing exceptionally long loads measuring up to 2.35 metres in length. Sitting 11cm taller than Fiesta, the B-MAX also provides extremely generous accommodation for its occupants. Drivers benefit from a higher ‘command' seating position, while rear seat legroom and headroom is significantly improved. In developing the B-MAX's unique integrated B-pillar body design for production, Ford engineers have ensured that it delivers the same outstanding levels of crash protection as Ford products with a more conventional structure. To deliver the required performance in side impacts, the structure of both front and rear doors has been significantly strengthened - with ultra-high-strength Boron steel in key load-bearing areas - so that the door frames work together to absorb energy like a ‘virtual B pillar'. Special safety interlocks and reinforced latch mechanisms ensure that the doors remain firmly fixed to the roof and floor structure during an impact, and enable the front and rear doors to act together to protect the occupants. When these measures are combined with other structural enhancements to the bodyshell and the latest restraint system technologies, the result is a body design which meets the highest safety standards. The exterior design of the B-MAX shows how Ford's kinetic design language can be applied to its unique new vehicle format, creating a compact, sporty and stylish car which adds its own distinctive character to Ford's popular MAV line-up. The vehicle's striking front-end features a bold new interpretation of Ford's signature trapezoidal grille. Other distinctive kinetic design elements include strong headlamp graphics, the muscular shoulder line with its powerful undercut, a characteristic window line with its kick-up behind the rear doors, and the prominent wheel lips. The bold three-dimensional surfacing of the body sides helps to avoid the tall, blocky look which is common in this class of vehicle, and includes a unique new rocker treatment, with a stylish ‘zig-zag' form on the rear doors. With its distinctive window graphic, wraparound tailgate glass, and slim tail lamps split by the tailgate, the rear of the B-MAX is closely reminiscent of the S-MAX. Strong horizontal feature lines help to emphasis the vehicle's wide and confident stance. 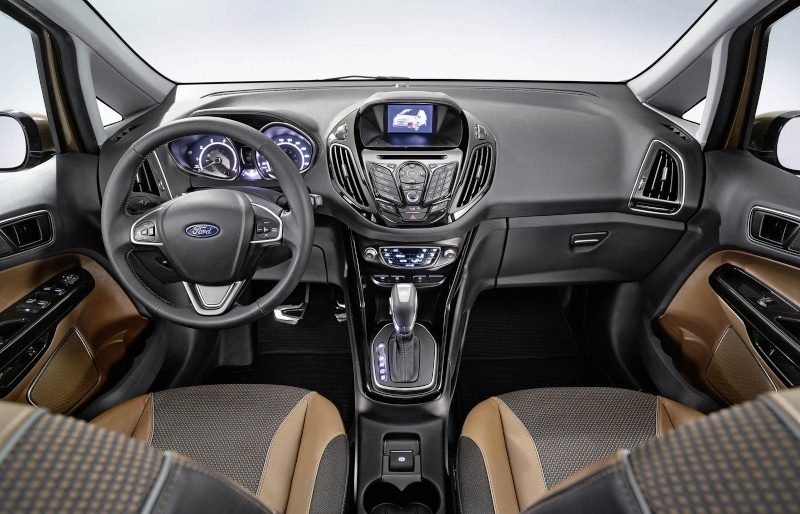 The cabin retains the dynamic, sporty feel of Ford's small-car interiors, but introduces the more premium character and decorative elements from the larger C-MAX. Driver controls are based on Ford's HMI (Human Machine Interface) approach, with a large six-inch touch screen display mounted in the centre of the upper IP, above the much-acclaimed mobile-phone style integrated control panel. The sensation of space in the interior is enhanced by a full-size panoramic glass roof, which covers the entire roof area. The B-MAX is powered by an ultra-low-CO2 powertrain, featuring a state-of-the-art three-cylinder 1.0-litre Ford EcoBoost petrol engine equipped with the Ford Auto-Start-Stop system. This three-cylinder Ford EcoBoost represents the next addition to the global family of Ford EcoBoost engines. Like the 1.6- and 2.0-litre four-cylinder Ford EcoBoost engines, which have recently been launched in Ford's European medium and large cars, the 1.0-litre unit combines direct fuel injection, turbocharging and twin independent variable cam timing to achieve significant reductions in fuel-consumption and CO2 emissions. Designed to replace larger conventional four-cylinder petrol engines, the three-cylinder Ford EcoBoost engine is undergoing final development prior to its production launch. "The B-MAX demonstrates Ford's commitment to providing customers with exciting and innovative vehicles," said Stephen Odell. "We believe that the new concepts and technologies it showcases will have a major impact on the small car market."